Golondrino James , under jockey Edwin Pena, defeating Checkmyshoesout in the $60,442 Lucille Rowe Derby at Arapahoe Park Saturday afternoon. AURORA, CO�JUNE 4, 2016�Second fastest qualifier Golondrino James proved he was the best today by posting a half-length win over Checkmyshoesout in the $60,442 Lucille Rowe Derby at Arapahoe Park. Thatza Fact Jack finished one-length back in the show position. Under jockey Edwin Pena, Golondrino James kept his 2016 record a perfect 2-for-2 by completing the 350 yards in :17.770 seconds, a 90 speed index. The $24,178 winner's purse boosted his earnings mark to $35,598. Miguel Pena conditions the IVORY JAMES gelding for owner Margarita Cardenas-Ramirez. Francisco Cornejo bred the bay from the Wave Carver mare Tahiti Wave. He has compiled a (5) 3-2-0 record. Checkmyshoesout picked up $12,089 for owner Miguel Angel Martinez. Zachary Quezada trains the filly. Daniel Valles had the riding call aboard the Barbara Kelly Colorado-bred. 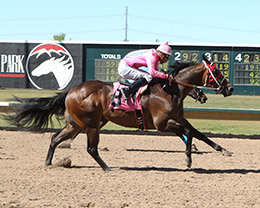 Levings Racing LLC's Thatza Fact Jack was saddled by trainer John Hammes and ridden by jockey Joe Badilla, Jr. George Seward bred the gelding in Colorado. Thatza Fact Jack earned $7,253 to bring his earnings mark to $33,661. Completing the field were Golden Special Pie, Runaway Traffic, Dg Dashin Fury, Your Forever Dashin, El Capo de Campeones and Keep Kissin Me.